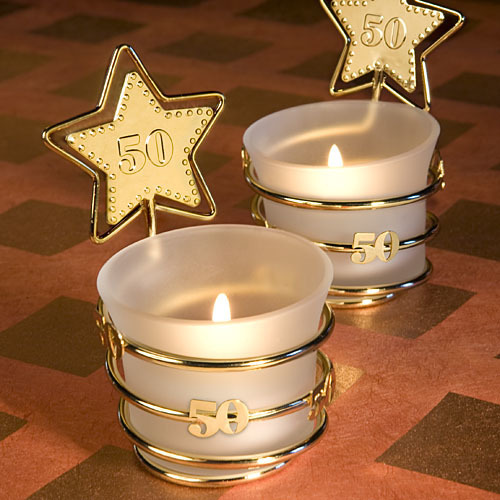 Give your guests the star treatment with these glitzy golden candle keepsakes. Each favor measures 3.5" x 2.25" and has a frosted white glass candle holder with a white tea light candle inside resting in a gold metal coiled wire base. The base's coil wraps around the holder with "50" enhancements and rises up to form a star shape with a beaded star design "50" charm at its center. Sure to leave your guests starry eyed, each comes individually packaged in a white box. Perfect as 50th Birthday Party Favors and/or 50th Wedding Anniversary Favors. Please allow up to 5 business days to fulfill your order. Please note that because this favor is made of glass, their weight is heavy and shipping charges may be higher than expected.